Cath, Thomas, Frances, Isobel, Mary Sloan, Jack, Richard, Carl, Peter, Linda, Jacqui, Leslie, Florence and Gordon were led by Allan Leiper from Ballantrae Cemetery. 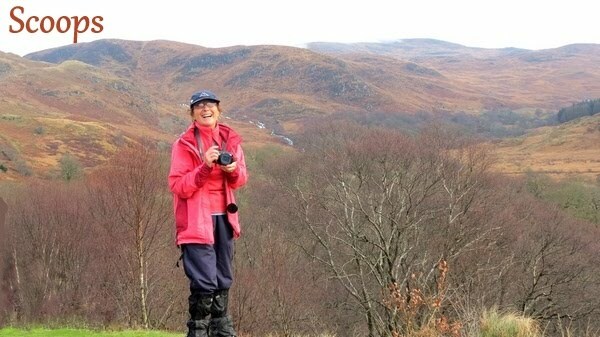 The forecast was for rain early, dying out by 4pm but it stayed dry for a long time, which was fortunate for Cath who had forgotten to bring her boots! 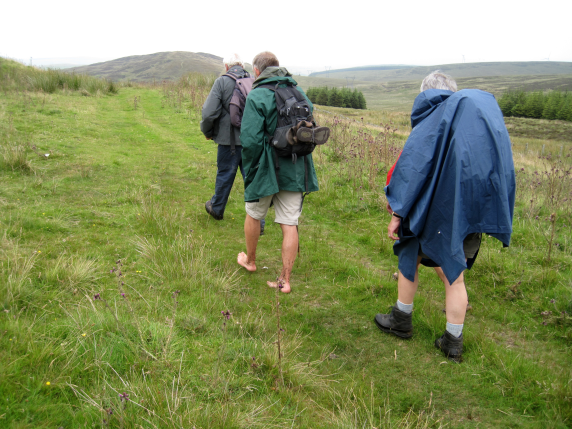 She and Thomas had shorts on (as had Linda Highley) and Cath had on a thin ‘waterproof’ jacket. 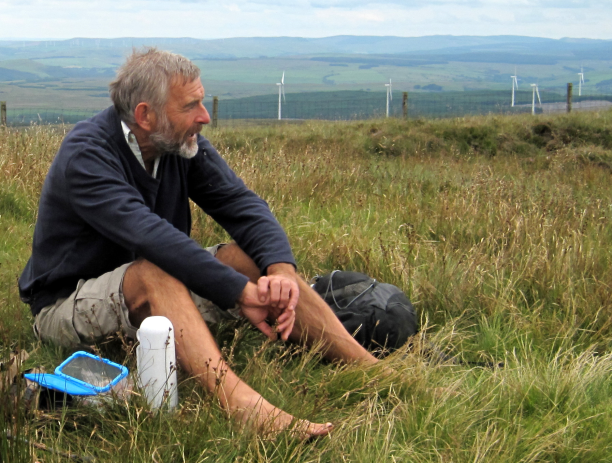 Thomas opted to wear his walking sandals to keep Cath company but discarded them when we got to really boggy bits where wearing them would have been a waste of time! 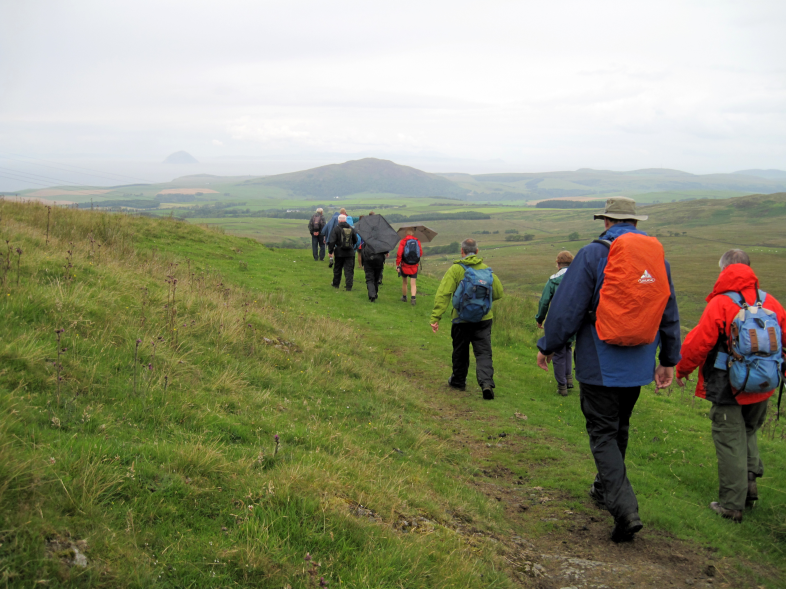 In spite of the weather forecasts, which had predicted heavy rain, fifteen ramblers assembled at the new cemetery near Ballantrae for a walk into the surrounding hills. As it turned out the weather was quite pleasant and the air remarkably clear. One member pointed out that the Paps of Jura were visible as a grey outline beyond the Kintyre Peninsular some 70 miles away. 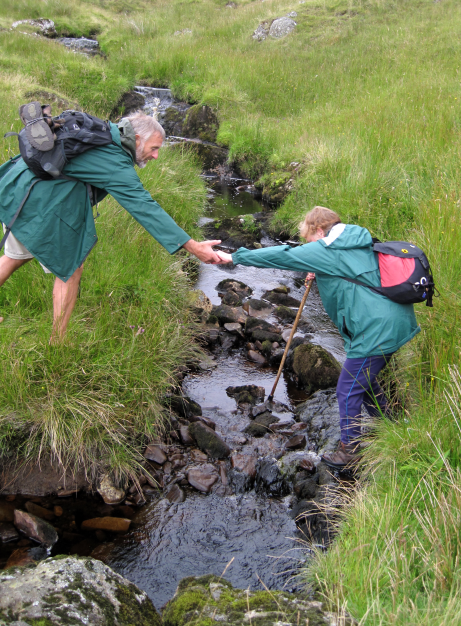 Two walkers had an unusual response to the predicted wet weather. 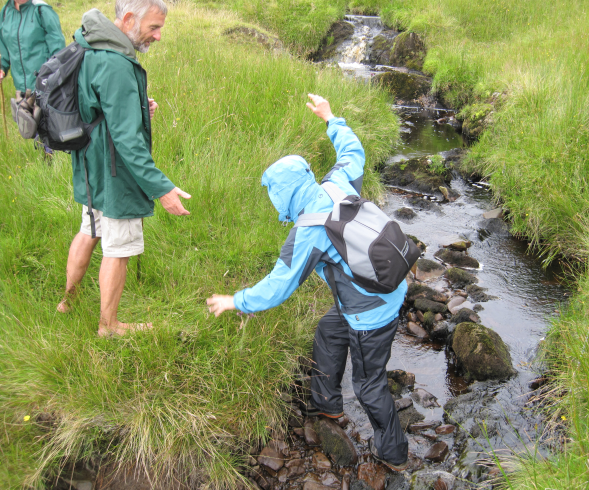 They had decided to wear sandals rather than the usual walking boots on the principle that the water would flow out of them as easily as it flooded in! The group set off towards Ballantrae and then turned up a narrow, grassy lane between the houses towards the A77. 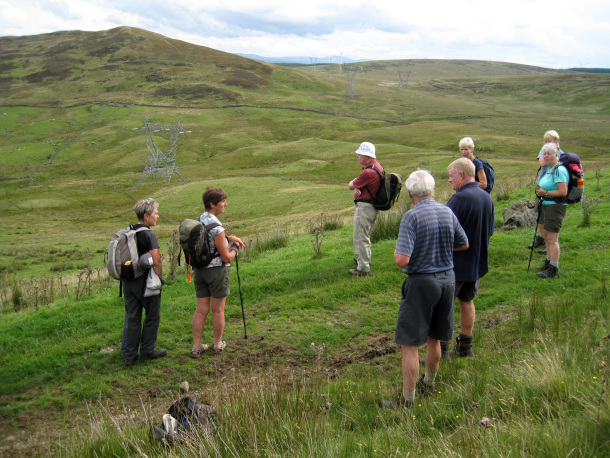 The busy road was crossed and the walk continued up the road towards Lemon’s Glen and Auchairne Estate. A steady climb soon reached Auchairne Bridge where a number of walking routes were well signposted. The group carried on uphill on the route to Cairnryan. On emerging from the woodland they arrived at the end of the tarmac road at Kilwhannel Farm. 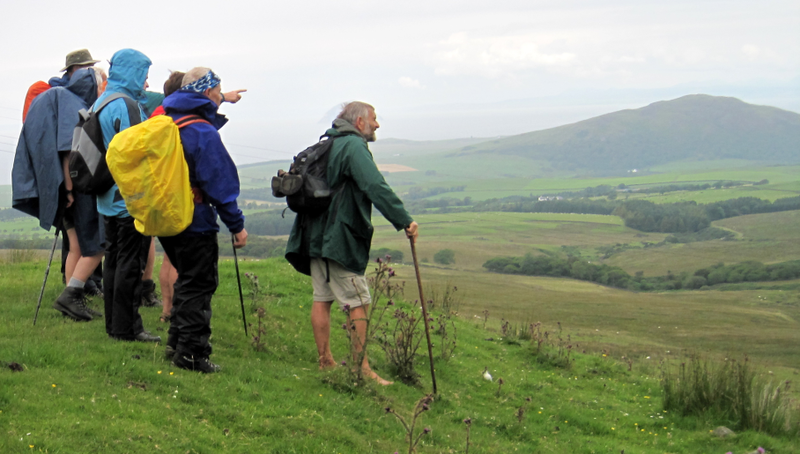 The group paused to admire the extending view up the Clyde Estuary towards Arran with the Ailsa Craig standing out brightly against the grey waters and Knockdolian Fell standing proudly on the other side of the Stinchar. 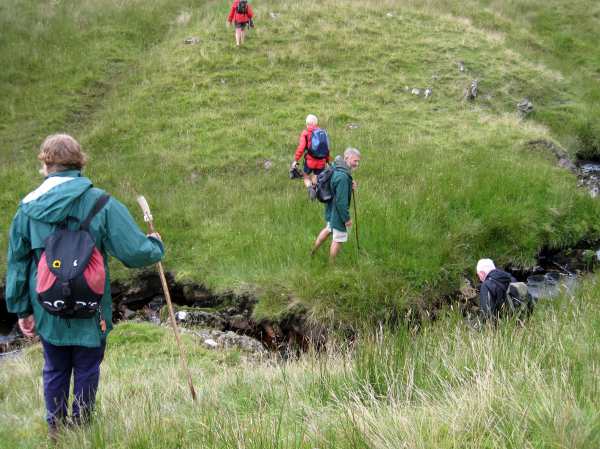 From there the route continued up a grassy track which still climbed steadily round the hills at the head of Glenapp. 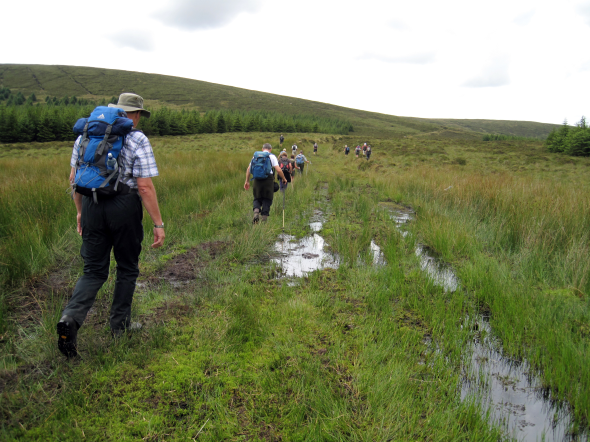 The route led between young conifer plantations and the track deteriorated with some areas badly flooded due to blocked drains. Soon the group reached the watershed and were rewarded with views southwards towards Luce bay over the track leading down to Lagaferter. 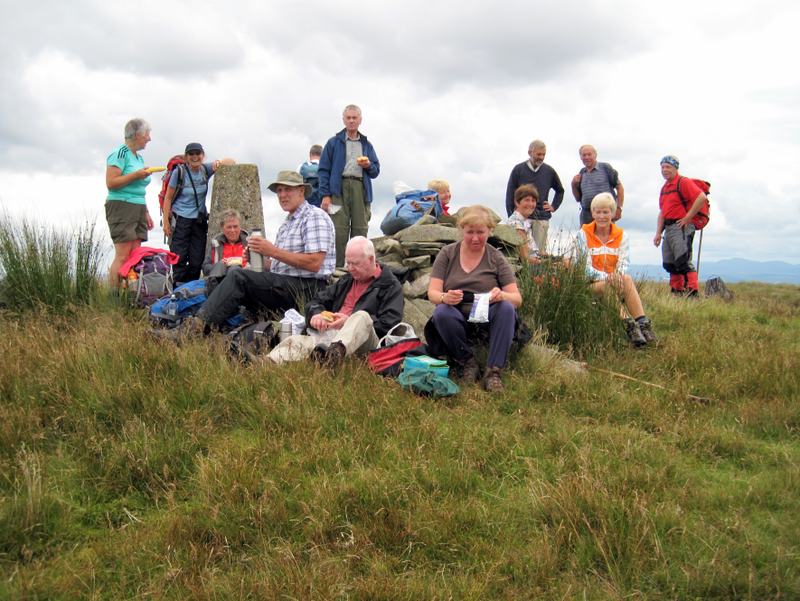 A short walk over the moorland led to the summit of Beneraird where they stopped for lunch. The views from the summit were extensive in all directions. To the south-east the Awfu’ Hand range stood out clearly. Further south-wards the Minnigaff Hills were shrouded with cloud which promised deteriorating weather. 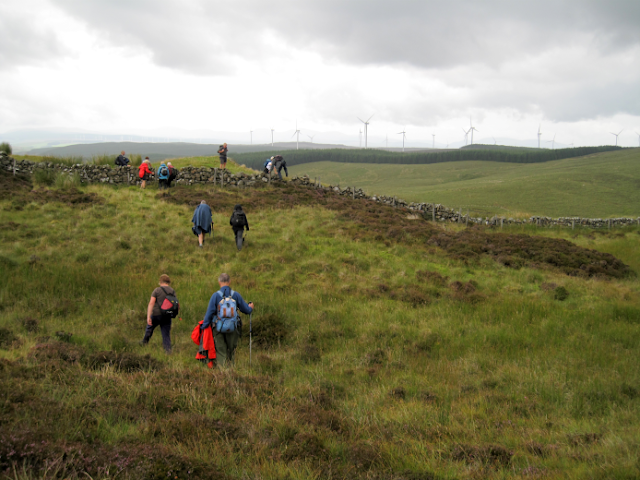 In all directions windfarms arose above the moors and forests. Five large collections of windmills were visible. Current planning applications will, if approved, make an almost continuous line of turbines from Straiton to Portpatrick. 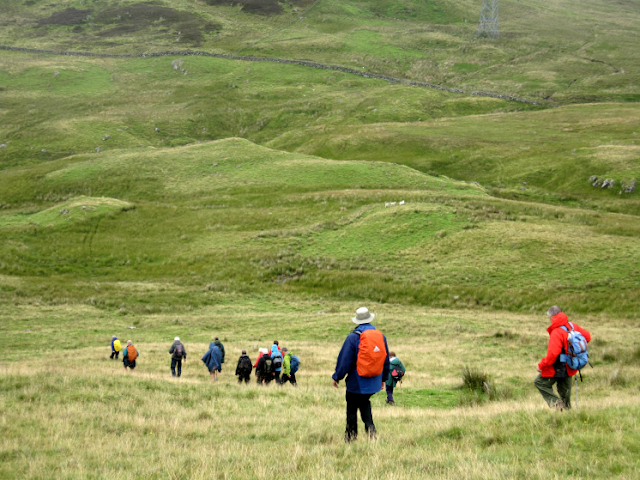 After lunch the walkers retraced their steps back down the track to the slopes of Benawhirter. The first spots of rain arrived and the group speedily donned their wet weather gear. A short, sharp climb achieved the summit with views back to the summit of Beneraird across what looked like difficult walking conditions of peat and tussocks. 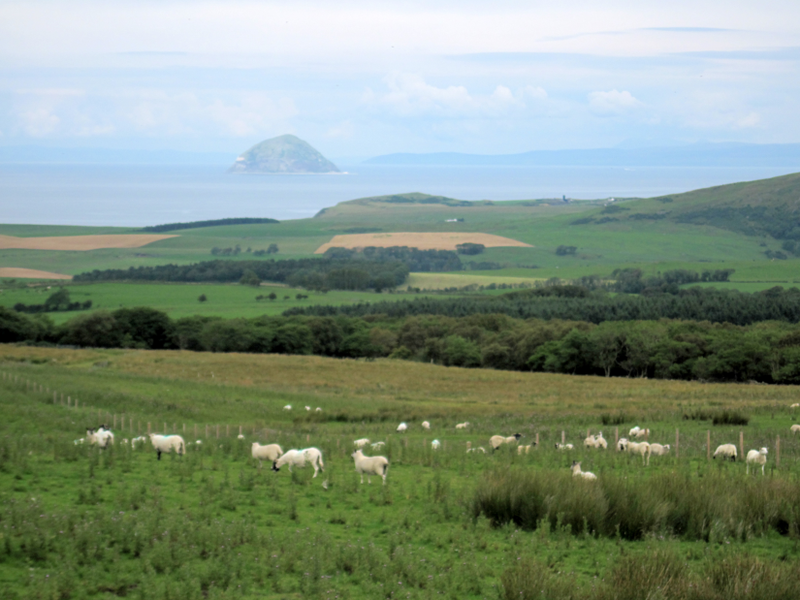 In the other direction they could just see Ballantrae, their ultimate destination. 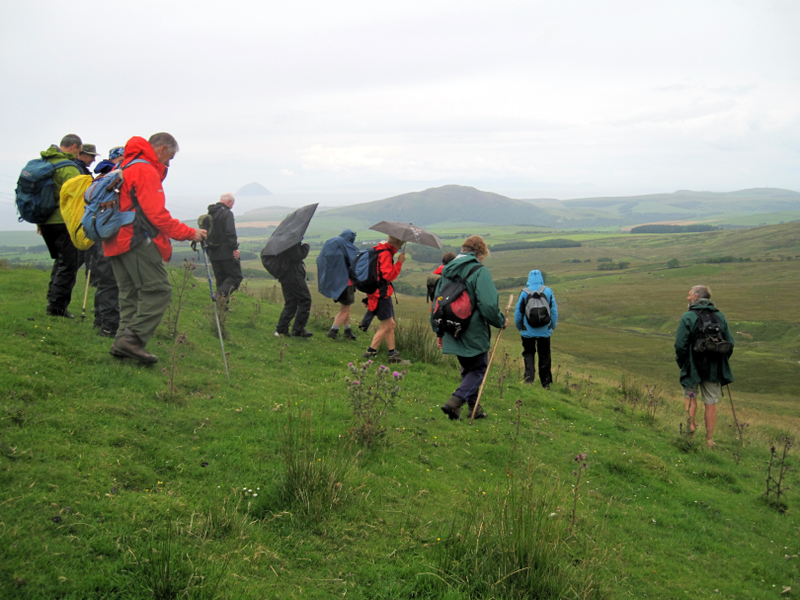 The rain had now set in, in earnest and the group continued north-eastwards over the Balrazzie Fells until they reached the track on Balkissock Farm. Here they turned northwards and headed down towards the farm. The stone road gave way to tarmac at Balkissock and the group trudged west and north down to the caravan site at Laggan. They took the track through the caravan site and through the woods along the top of the bank above the Stinchar. They were glad of the shelter provided by the overhanging trees. It was disappointing to spot a Grey Squirrel scuttling across the track; a further expansion of their territory into the Red Squirrel sanctuary in the South West corner of Scotland. The track rejoined the tarmac road at the West Lodge and they followed it down past the Laggan Dairy where a friendly farmer delayed his herd of cattle which were being brought in for milking until the group had passed. A short walk brought the group to the A77. 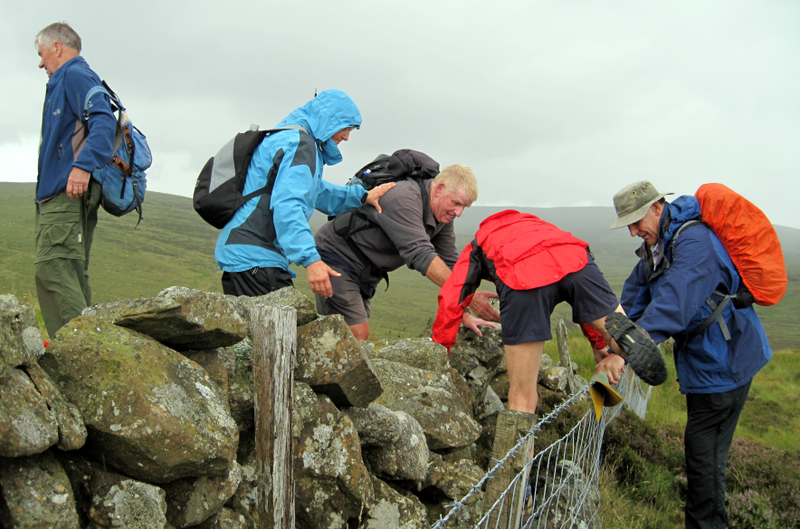 The rain had eased now and the final uphill half mile back to the cars was briskly undertaken. 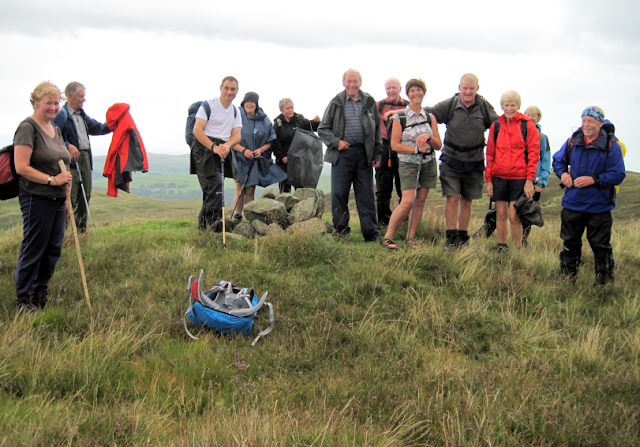 A tired but satisfied group had enjoyed the 13 mile hike. Cath never complained although by now she was completely soaked and cold and when we eventually got back to the cars she insisted that she was OK to go to the Garden Centre for coffee. We four went, together with Mary Sloan and Forbes (who had turned up later meeting us when we were heading downwards, in the rain) and Cath managed to get warmer and dry out a little before leaving there for home.